Would you recommend Timelog to a friend? Why is it talking german to me? @jarizwarts Hey Jari, thanks for the heads up! We missed a translation key on that page - should be fixed now! Product Hunters, we'd also love to get your feedback on our ideas for future iterations of Timelog: - Editing of log descriptions - Editing of log projects - Export project logs as .csv - Export project logs as .pdf - Collaborative logging on projects - Invoicing directly from projects - API for integration with further services What else are you missing to make Timelog your default solution to track efforts on projects or clients? @prattarazzi Thanks a lot for the feedback, Eddie! Really appreciate it. Do you get the errors in logged-in or logged-out state of Timelog? @herbigt @prattarazzi I've had them in both versions. I'm not sure if it's related to multiple browser windows. I wanted to keep one window open to time things whilst using the other window to look at other parts of your website. The additional information is: -Stop Action Error total:- Edit: I closed my browser windows with Timelog. I reopened 1 window. The timer was still running. I click stop. I get the error message. No event is logged. I refresh and the timer continues to run. @thibautdavoult Hey Thibaut, thanks a lot! Appreciate your feedback. Do you constantly get this message or only when you try to log something? A quick clean-up of your cookies should help at last. Hope you can enjoy Timelog anyways! Hello Product Hunters! even though we haven’t been added as the makers yet, my pal Ludwig and I are excited to introduce ourselves and our project Timelog on Product Hunt. It’s a simple and beautiful platform for easy time-tracking, designed for freelancers and small companies. We wanted a simple solution for project-based time tracking across all devices. 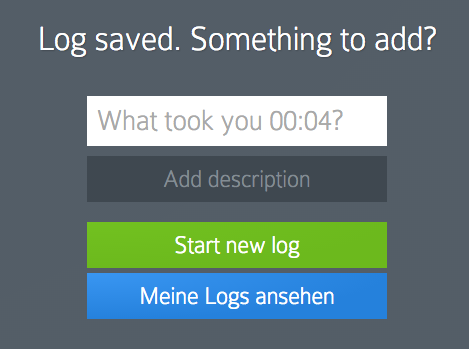 We’re already working on single log editing, collaborative logging and billing integration for future iterations. We’re in the middle of tackling some cookie-related hiccups but can’t wait to hear what you think! We certainly hope you’ll like Timelog and are available for you in the comments for further questions and feedback! Make time to get your tasks done. Discover the best time tracking apps on Product Hunt.